Walt Barrett's Global Battery And Auto Maintenance Services: Battery Balancer - Our new electrolyte battery booster treatment for heavy duty lead acid Batteries by Walt Barrett inventor. 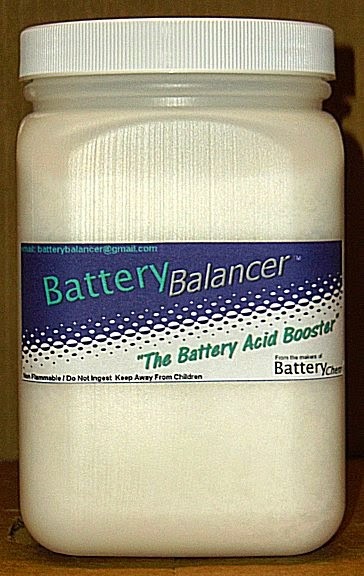 Battery Balancer - Our new electrolyte battery booster treatment for heavy duty lead acid Batteries by Walt Barrett inventor. The reason we formulated Battery Balancer is because certain batteries even after reconditioning, still have a lower than normal specific gravity (SG) and this lowers the amp hours capacity of the battery-- in spite of the fact that it may be working perfectly otherwise. The reason that the specific gravity is still low on a reconditioned battery is because the acid in the electrolyte is in a weakened condition usually caused by age, using tap water instead of distilled water, overheating, repeated overcharging and poor maintenance practices. Any one of these things can damage the battery acid. In most cases Battery Balancer when used properly, will correct this condition. The best way to do this is after treating the battery with Battery Chem™ first and allowing a six hour cool down period you add Battery Balancer a tablespoon measure at a time to only the cells with the low specific gravity each day until all the cells have gained their full specific gravity readings back for a normally fully charged battery. 1.260 to 1300 is acceptable. Repeat the process until all cells are reading at least 1.260. If your cells are over filled with water you can remove extra water with your hydrometer and save it in a plastic bottle for the next time that you need to add water. Batteries that are frequently charged need to have water added to them weekly in many cases so always check them or you will ruin them. ALWAYS USE DISTILLED OR DEIONIZED WATER IN YOUR BATTERIES. TAP WATER WILL RUIN THEM. You can compare the specific gravity reading of a battery to the octane rating for fuel. Let's use an electric golf cart or electric forklift for examples. A lead/acid battery pack that is fully charged at a specific gravity of 1.265 has much more electricity (energy) stored in it than a battery pack with a specific gravity reading of 1.200 which is very low. Like fuel octane where the higher the rating-- the better mileage you get in your car, the higher the specific gravity in your battery--the longer the charge lasts. A forklift battery that's supposed to last 12 hours on a charge, but only lasts 5 hours can really cost a company a lot in lost production. Batteries are rated in amp hours of storage. The more amp hours of electricity stored the more fuel you have in your tank, so to speak. Batteries with high amp hours of actual energy stored will propel your vehicle further than batteries with very few amp hours left in storage. As a battery ages it loses efficiency. Contributing factors to the loss of efficiency in a lead acid battery are low water, not using distilled water, over charging, under charging, improper charging, sulfation, damaged battery acid, short circuits and mechanical failure. We prefer flooded lead/acid batteries with service caps with the emphasis on service. When used with the proper service our additive products Battery Chem™` and Battery Balancer can double or even triple the lives of your heavy duty batteries. A must read before proceeding. Battery Balancer is only to be used after a battery has been fully treated with our primary product Battery Chem, fully charged and load tested. Otherwise you will receive false readings and could over treat the cell. Always keep a written record of your readings. You will need to protect your eyes, face, hands and clothing before working on lead acid batteries because they contain sulfuric acid. In order to use this product properly you will need a Battery Hydrometer. It is the best way to tell the state of the electrolyte in a lead acid battery. Use a hydrometer to measure the specific gravity of the electrolyte solution in each cell. The hydrometer is a simple and inexpensive test instrument used to measure the density or weight of a liquid compared to the density of an equal amount of water. A lead acid battery cell is fully charged with a specific gravity of 1.265 at 80° F. For temperature adjustments, get a specific gravity reading and adjust to temperature by adding .004 for every ten degrees above 80° F and subtracting .004 for every 10 degrees below 80° F. We like to see Specific Gravity readings between 1.215 to 1.300 With automotive batteries averaging about 1.260 and heavy duty traction batteries topping out at 1.300. Readings of 1.300 will wear the battery out faster. 1.260 is good for automotive and readings of 1.215 to 1.260 are good for battery back up applications. Higher than recommended readings will definitely store more Amperage but will wear the battery out faster. A battery cells specific gravity is a great way of measuring a batteries state of charge. This is because during a discharge the specific gravity decreases linear with ampere-hours discharged. The specific gravity also increases as the battery is recharged. A BATTERY MUST BE FULLY CHARGED AND REST AT LEAST 8 HOURS WITH NO LOAD BEFORE YOU CAN TAKE AN ACCURATE SPECIFIC GRAVITY READING OR IT WILL NOT BE ACCURATE. We have a free video on this procedure.